Rough morning…puppy seems to think if he howls, he is somehow scaring the coyotes away. Or he’s communicating with them in coyote talk. Or he’s just scared. It’s really hard to say. I just wish he’d stop. The Golden Retriever feels no need to communicate with the pack that runs by my house at 4 AM. And I greatly appreciate that. Maybe size does matter. Simba, the part-Pomeranian, drives a mad sports car with tinted windows and tails you down the road because you’re only doing 5 miles above the speed limit. Calli, the Golden, drives an old Subaru going 5 miles below the speed limit, oblivious to everyone around her, quite happy to be toolin’ along. Certainly she perks up when balls are being thrown or there’s a walk to be had, but otherwise? She’s mostly lying around relaxing. There’s something to be said for living with each of them. I had hoped to be done with the ironing yesterday, and I think I would have if (a) I hadn’t gone to the gym, (b) my book weren’t so good so I kept reading when I should have gotten up and started ironing, and (c) I weren’t worried about how the pieces would fit together. Usually on a big quilt, I iron sections together and then don’t put the whole thing together until I’m putting it on the background. I have an ironing board extension (well, I have a board on top covered with a towel), but it’s still not big enough for this thing, to try to get everything positioned correctly. The pieces ironed on Teflon get really heavy and slip off the board at some point. There were a couple places where I had to put a small piece of fabric behind to fill in a hole, but nothing major. But I couldn’t figure out how to get the arm in the middle positioned on the ironing board. It just wasn’t big enough. So I dropped to the floor. I had to fuss with it a bit to get it all to go where it should, but it eventually worked. I often do the final iron on the floor for a big piece. That’s probably why my floor looks like crap…because I iron on it. I have to keep that in mind for when I eventually replace the flooring. I’m sure the Home Depot person will be able to help me find a flat, solid floor that takes a hot iron and doesn’t melt or otherwise disfigure. A simple requirement. I decided against trying to iron his head and arm onto the existing stuff at this point…too much weight. So what’s left? The thought bubble, which won’t take long. It was after midnight when I stopped there, though, so I figured it was better to get some sleep and finish ironing tonight. So I’ll iron it all down to the background tonight and maybe start the stitch down. Definitely I’ll be doing stitch down on Thursday and probably Saturday…it’s a big quilt, so it will take a while. Distance over number of pieces is what matters on quilting and stitch down. I’ll have to check my backing and batting stash over the weekend and make sure I have enough…maybe sandwich on Sunday? 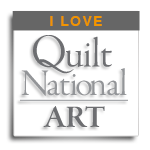 Start quilting? I’m ready to be done with this one. I do (finally) like how it’s turning out, but it’s still not somewhere I want to hang out for long. The subject matter is worrisome. Hard to say if these two are getting along any better. I’ve seen some playful moves from mine, but Satchemo is still just trying to invade space. They do both sleep on the bed sometimes, one at my feet and one under my armpit. It makes it hard to move sometimes. But I’m looking forward to the day when they curl up together. Or at least exist in the same space without glaring or yowling at each other. Man I want time to draw. It was loud last night, the voice…draw draw draw. I may just have to go with it at some point.